Quite a hual of ribbons! Accoyo Champi is a ribbon winning daughter of a multiple champion Charan who is out of the incredible MacGyver and NGG Accoyo Suri Princess (Uribe daughter). Charan is the maternal sister to Accoyo Chaska, 8x Champion and IAO Supreme Fleece 2010. 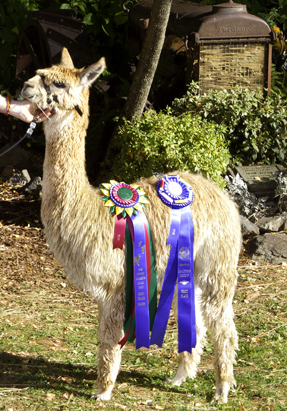 Charan has already produced Champion crias. We expect many more. Champi’s sire is DDF Accoyo Armani is a champion himself and has produced a number of champions including GVA Armory, AOBA 2010 Grey Suri Male Champion. 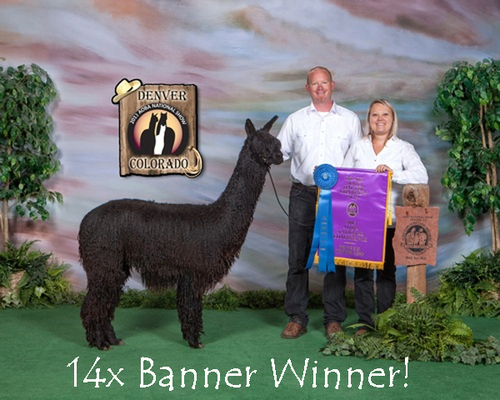 $2,000 Bred for a Black Cria!! 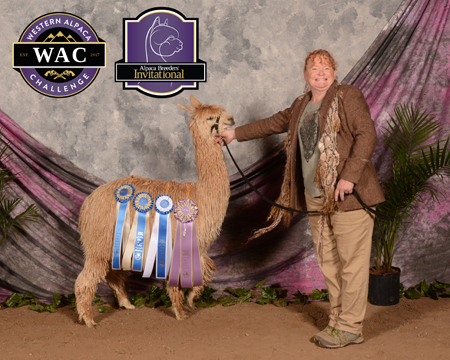 The lovely ShimmerNShine.. lives up to her name, really NICE LUSTER... long staple, good fineness, slick cool hand.. out of the 14X Champion GLR Nico and Derwydd Accoyo Champi! Great start to her show career this fall in Bend! All her ribbons come with her. 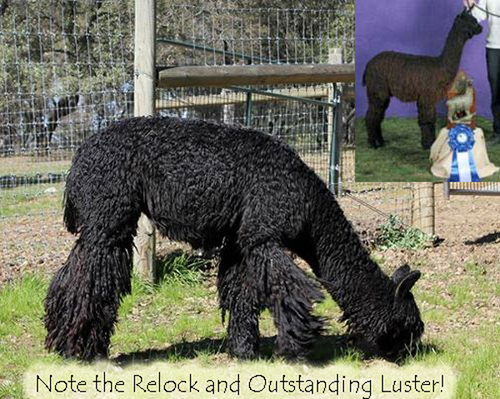 We bred Shimmer to the multi champion true black herdsire Bluegrass Peruvian Rythym N Blues this spring, we fully expect a black cria, since know there is black on both sides of the pedigree! She sells with this breeding. And she is confirmed pregnant! Luster 4 out of 5!! Fineness 4 out of 5!